out on spring migration in 2011. Based upon ten very successful expeditions to Costa Rica in 2004-2010 and one to Belize, Hilton Pond Center for Piedmont Natural History--in conjunction with Holbrook Travel--is for the first time offering an exciting and educational field trip in 2011 to study Ruby-throated Hummingbirds on their wintering grounds in Guatemala. Plus, we're returning to Costa Rica and Belize for two excursions and--also for the first time--will take a group of hummingbird enthusiasts to Nicaragua! Join us this year as we "follow the hummingbirds north" in spring migration. Ruby-throated Hummingbirds, Archilochus colubris--which occur in 38 U.S. states and across southern Canada from March through October-- are the most widely distributed hummingbird species. Nonetheless, they are poorly studied in Mexico and Central America where they spend their non-breeding months. 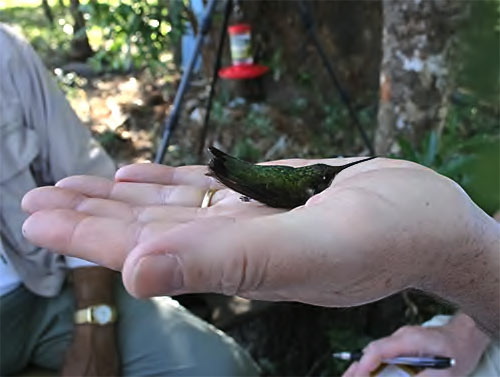 During our 2011 nine-day field trip to Guastatoya in Guatemala's Progreso Province, Center director Bill Hilton Jr. will teach participants how hummingbirds are observed, captured, banded, and released. 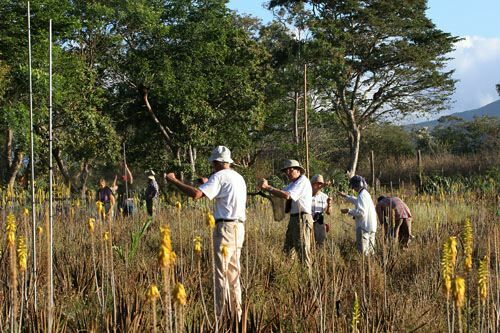 As "citizen scientists," participants will play integral roles in conducting field work, will visit diverse habitats, and will learn about fascinating aspects of Guatemalan natural history and culture--from cloud forests to semi-arid valleys, from nocturnal mammals to tropical insects. 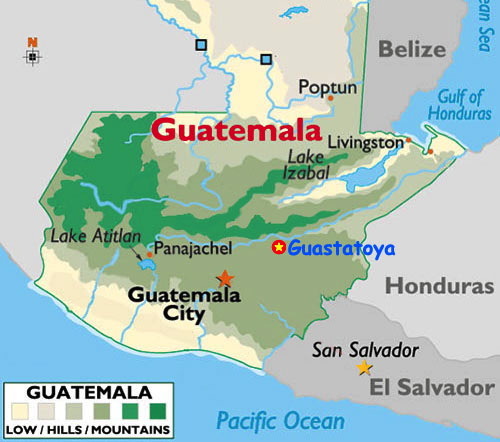 Guastatoya is in east-central Guatemala (see map above) about 45 miles northeast of Guatemala City; it is the capital of El Progreso Province. 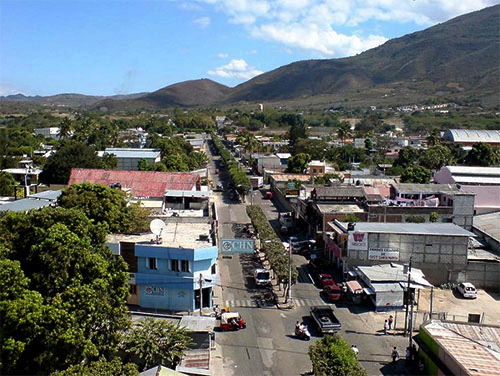 The town (photo of main thoroughfare, below) has a 2002 census population of about 11,000 and sits in an east-west valley at an elevation of about 1,850 feet. Our nine-day Guatemala expedition is scheduled to be based at Hotel Casa Guastatoya, used by business travelers and tour companies because of its accommodations, food, and proximity to Guatemalan nature locales. All rooms are simple but comfortable with air conditioning, hot and cold running water, clean towels daily, private indoor toilets and showers, single and/or double beds, and TV; the dining room offers fresh fruit, meats, and vegetables at every meal. 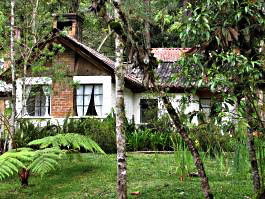 Casa Guastatoya, which has a swimming pool (above) in which to relax after a morning in the field, is a modest hotel situated on the town's central park. 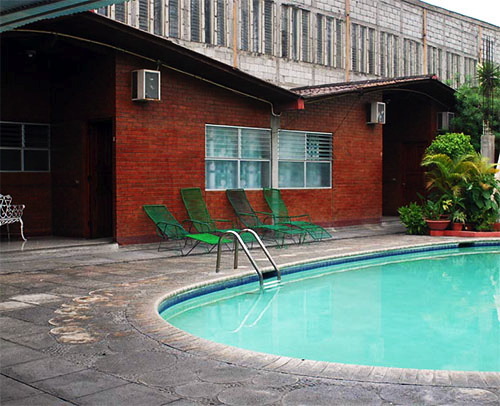 Banks, ATMs, restaurants, Internet cafes, and drug stores are within close walking distance. The hotel is about a 20-minute ride from our study site, to which we travel via air-conditioned tour bus. 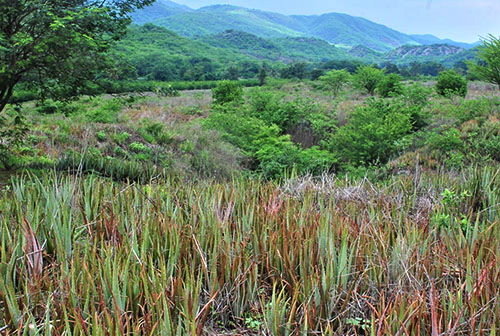 Our Guastatoya study site is a 35-acre Aloe Vera plantation (above) operated by Alfredo Oliva Véliz, who likewise owns the aloe fields in which we band hummingbirds in Costa Rica. Alfredo's Guatemalan finca is a bit hillier than the one down in Guanacaste Province; it also includes adjoining acreage with more than a thousand Lime trees. The fields where we will spend mornings catching and observing hummingbirds are almost always sunny in February; temperatures there go from mid-70s at 7 a.m. to near 90 at about 11:30 a.m. when we usually quit for the day. Near the field is a small hacienda for getting out of the sun. 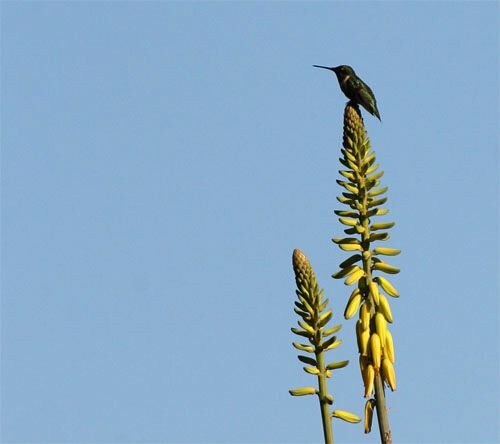 Our contacts in Guastatoya tell us each year in February they observe Ruby-throated Hummingbirds feeding on Aloe Vera nectar. We may also try to catch ruby-throats in special traps baited with sugar water feeders. 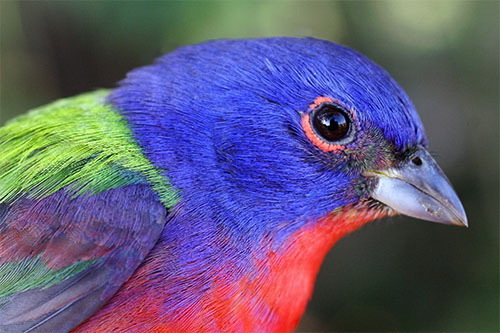 Traps are selective but mist nets are not, so we'll likely net and band other North American migrants such as Painted Buntings (male, above)--plus get chances to photograph exotic, non-migratory tropical species in-the-hand. Guatemala is host to 39 hummingbird species, some of which we'll undoubtedly catch in addition to ruby-throats. We will spend mornings catching and observing hummingbirds, usually stopping about noon when we quit for the day. This is our first hummingbird banding trip to Guastatoya, however, so as we get better acquainted with hummingbird behaviors at this new site we may need to adjust our daily schedule to maximize the success of our field work. We can't rule out the possibility of some afternoon or evening banding sessions that replace or supplement our morning work. In any case, participants will have sufficient time to eat, rest, and explore. 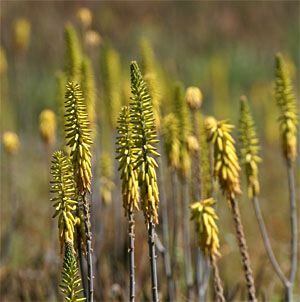 We doubt we'll see or catch as many ruby-throats in Guastatoya as we do in Guanacaste Province, Costa Rica--after all, Aloe Vera fields there may be the densest concentration for the species in all of Central America--but we won't know until we try. Unlike our Costa Rican and Belizean expeditions that are based entirely at one locale, during the Guatemalan excursion we will take a mid-week overnight field trip by bus to Coban, about two hours northwest of Casa Guastatoya. 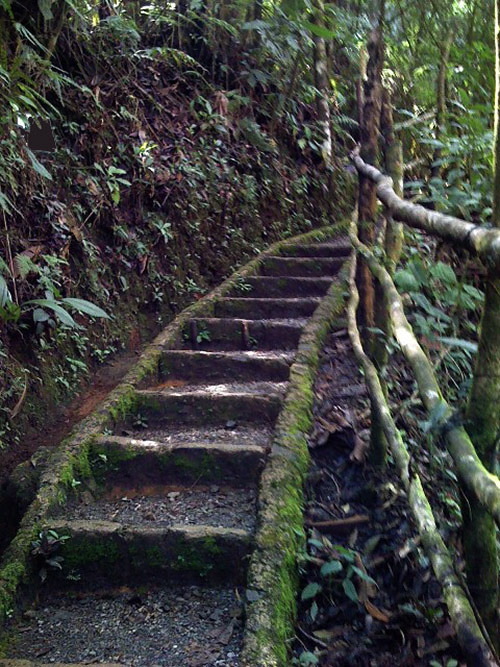 This excursion will allow us to get out of town and into a Guatemalan cloud forest at Biotopo Del Quetzal. There we have very good chances of seeing a local population of Resplendent Quetzals, Guatemala's sought-after national bird (above right) considered by some to be "the most spectacular bird in the New World." In the early morning several quetzals come down the mountain to feed on wild avocados in the trees just behind the guest cabins. Thus, we'll ask the staff for a wake-up call "when the quetzals show up." Other birds we may see in the Biotopo include Highland Guan, Golden-browed Warbler, Slate-colored Solitaire, Blue-crowned Chlorophonia, Common Bush Tanager, Yellowish Flycatcher, Unicolored Jay, Slate-throated Redstart, Chestnut-headed Oropendola, and Emerald Toucanet. After reading the itinerary and requirements below, please contact Debbie Sturdivant at Holbrook Travel (1-866-748-6146) if you have any questions about enrolling and/or to request enrollment forms. Register early to guarantee you can participate! Supper: At the hotel (occurs daily, unless otherwise noted). Lunch: Back at the hotel (occurs daily, unless otherwise noted). Afternoon: Explore Guastatoya on your own. 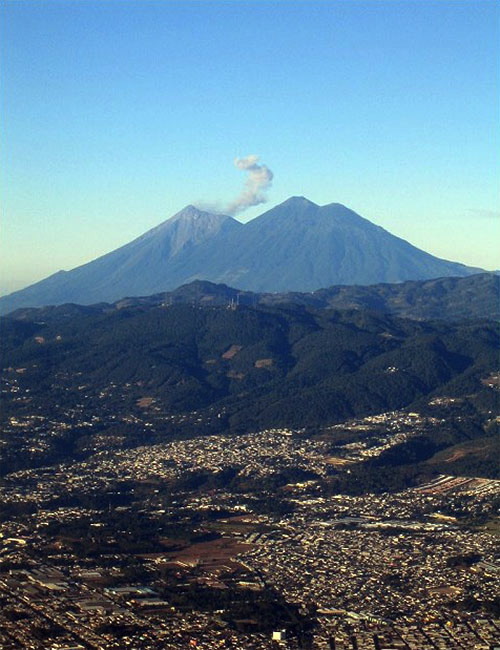 Afternoon: Visit Guatemala City to see Relief Map of Guatemala, a massive scaled map and monument depicting many geographical features. 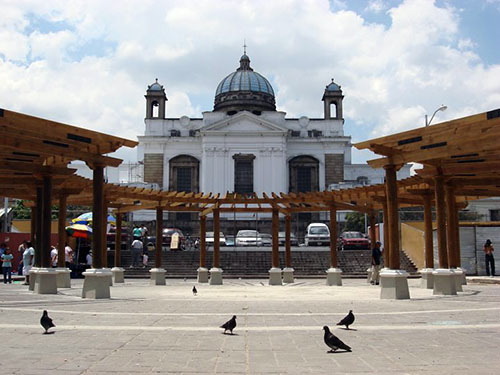 Tour the National Palace, whose elaborate interior houses paintings and sculptures by famous Guatemalan artists. Walking tour of Central Park and Mercado Central (above, with Cathedral Metropolitana in background), a great shopping market for Guatemalan handicrafts, especially leather goods, woolen blankets, and masks. Late Morning/Afternoon: Lunch at Guastatoya, then depart via air conditioned bus for two-hour ride northwest to Coban and Biotopo del Quetzal. Lodging at Hotel Posada Del Quetzal (above right; room sharing may be required because of limited space at this special facility). Late Afternoon: Initial exploration of cloud forest (as time allows). Early Morning: Arise when local guides hopefully tell us the Resplendent Quetzals have moved down the mountain to our cabins at Posada Montana Dekl Quetzal. Morning thru Early Afternoon: Breakfast & lunch at lodge. 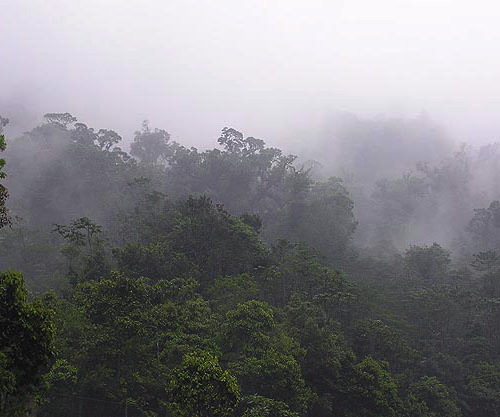 Explore cloud forest (above) with local guide and quietly stalk wildlife for unforgettable photos. 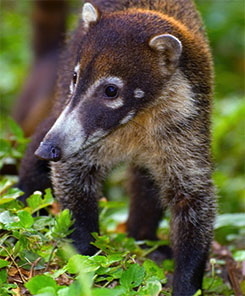 Animals in the Biotopo reserve include small lizards, pizotes (White-nosed Coatis, right), wild cats, monkeys, and many bird species. Visit orchid nursery as time allows. Mid-Afternoon: Depart Coban via bus for Guastatoya. Supper at hotel. Afternoon: Visit to San Agustín And San Cristóbal Acasaguastlán, two communities famous for religious and cultural structures from the Spanish Colonial Era. 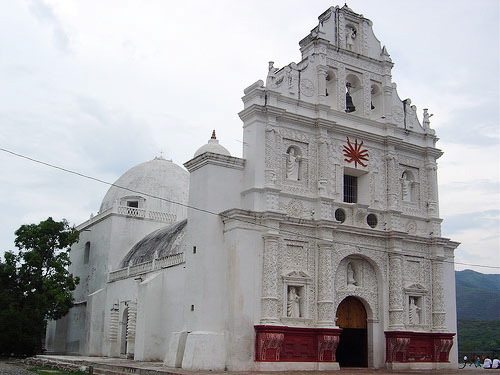 For example, the ornate facade of the church of San Cristóbal (above) was constructed by 1654 and has since been restored. Early Morning: Day Six of hummingbird observations and banding at study site(s) (road to aloe field, right). 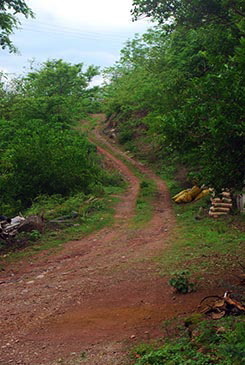 Afternoon: Explore Guastatoya on your own. Begin packing for next day's departure. Evening: Dream in your own hometown bed about hummingbirds and warm, sunny Guatemala! BILL HILTON JR. (below left), internationally known educator-naturalist, was twice named South Carolina Science Teacher of the Year and was honored as the state's Outstanding Biology Teacher. In 1998, The Charlotte Observer named him a Carolinas "Guardian of the Environment" for a lifetime of trend-setting work in conservation and environmental education. He has led ten highly successful hummingbird expeditions to Costa Rica and one to Belize. The December 2008 issue of Discover magazine cited Hilton as one of the top ten amateur scientists in America and one of the nation's "50 Best Brains in Science." Hilton is executive director of Hilton Pond Center for Piedmont Natural History. As principal investigator for "Operation RubyThroat: The Hummingbird Project," he received a 42-month grant from the National Science Foundation to integrate Operation RubyThroat with The GLOBE Program. 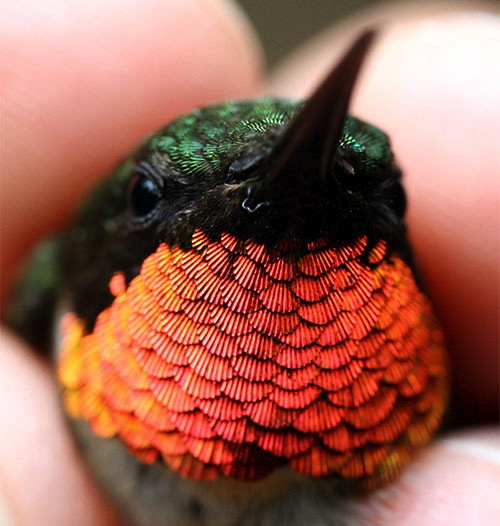 Since 1982, Hilton has banded more than 54,000 birds at Hilton Pond, including 4,000-plus Ruby-throated Hummingbirds. 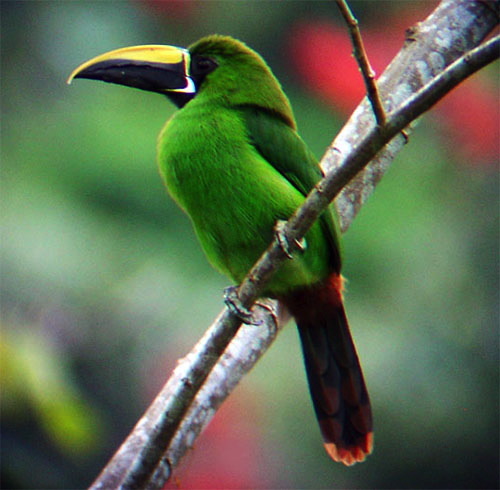 NOTE: Alumni of any Holbrook Professional Development Expedition--including past Operation RubyThroat trips to Costa Rica & Belize--are eligible for a $150 discount for any and all of the 2011 Operation RubyThroat excursions. After reading the information above, contact Debbie Sturdivant at Holbrook Travel by E-mail or phone (1-866-748-6146) if you have any questions about enrolling and/or to request enrollment forms. See you in Guatemala!